Long time no post, but that doesn't mean there hasn't been stuff going on. The second part of Act II has always been complicated to get right, so I'm glad every time it gets a nudge in the right direction. What started as a prologue became a prelude, then a prologue again. Due to its contents, we've reached the conclusion that prologue is the definitive term. That's the kind of updates you get from people obsessed with semantics. An entire day spent around Majora's Aria, and not everything is sorted yet. When the piccolo turns out to be too low to be heard in 90% of the tuttis, one's head does begin to spin. What was once scored for one piccolo and two flutes is now scored for three flutes with the first doubling as piccolo, because of reasons. *Translation: It's giving me a headache. Jeremy Smith, a PhD student in Music Theory, interviewed me some months ago for a paper he wrote as part of completing his Master's degree. 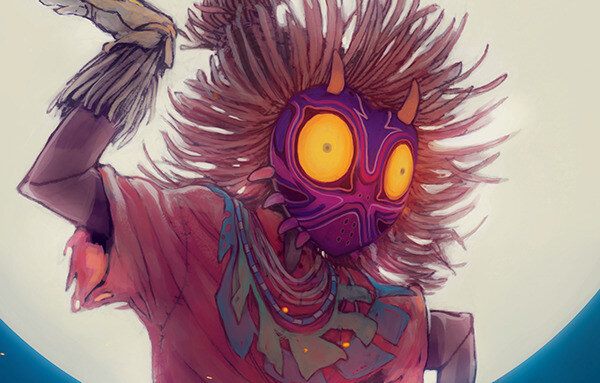 The paper analyzes the music of Majora's Mask and how it is viewed and used by fans of the game, and it includes Majora as an example (p16), along with the full interview as an appendix (p42). Upon revising Liam's proofreading of the plot summary, I've fortunately arrived at a conclusion that solves a problem of stage dynamic in the love duet of Act II. Took three days to put together a plot summary because of reasons. I've found that doing so has allowed me to distance myself from both the music and the libretto, allowing for a more general point of view on things. As a consequence, some vague details on how stage action is supposed to go have become more objective. Case in point, the climax of Kafei's Dream is now certifiably bitchin. Glitches aside, there's been the usual slow but steady progress of shaping up the score of Act I to its final form. Advances in the engraving of Act I. Miguel Jesus predicts the complete score won't be done before the end of Summer. Expect the makeover to the Giant's Lament to be up very soon.